Ripper Mix is another properly balanced combination. It contains 2 seed units per strain in an entirely protected hazard proof box. The feminized Philosopher Seeds Ripper Mix gets you two top quality seeds of Sugar Pop and Fruity Jack. If you ever tasted the original Jack the Ripper weed, you will certainly love this combination. This kit consists of two hybrids - in both cases a reversed male of Jack The Ripper has been used. The first strain in this pack - Sugar Pop - is a combo of 60% Sativa and 40% Indica ingredients created with the active participation of Golo Line breeders. It is a rather easy to grow variety that would suit the needs of either inexperienced or busy growers. Very resistant to high temperature and diseases but demanding in nutrients. Once it enters the bloom period, it transforms into a large central bud tree with plenty of beauty pistils covered in resin. This resinous stuff is ready for harvest after 55 days of flowering. Indoor harvest will reach up to 500 g per m2, while outdoor growers can expect 600 grams per plant, ready for harvest in mid October. The taste can be described as a mixture of earthy Kalijah and Jack the Ripper. When dry it does not spread much odor, so it can be recommended for sneaky transportation. Perfect social stress relief companion. 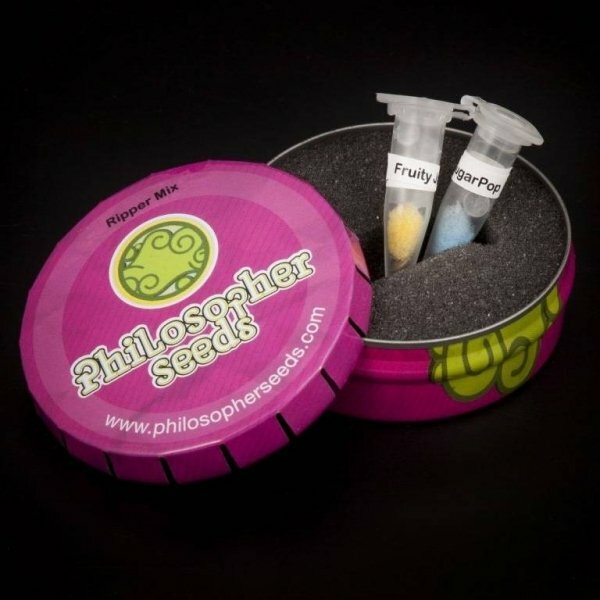 The second ingredient of the Philosopher Seeds feminized Ripper Mix is Fruity Jack. This strain is a mixture of Spannabis 2012 winner Respect #13 with reversed male Jack the Ripper. The combination in final is a 65% Sativa and 35% Indica strong structure variety. Sativa genotype requires a density in growth max up to 16 plants per m2. SOG cultivation can be done with 20 plants per m2. This variety is always thirsty for nutrients so please take attention to sprout it on an rich ground. The reward is a majestic plant with fully covered resin buds perfect for hashish workshop. Indoor yield reaches up to 550 gr per m2 while Guerrilla crop 600 gr per plant being ready around the second half of October. Fruity Jack is one of the most psychoactive variety contributing to stress disconnection. You will adore the perfect fruity taste and the pleasant chilling high.